Have you ever been told that you are making too much noise, or that your class is getting too noisy? Of course you have! But what exactly is noise? Noise is any sound which bothers you. How you feel about a given sound is a personal opinion, and what is noise to one person is not necessarily noise to another person. it happens in an unwanted situation, like yelling during a test! The unit for the loudness of sound is the decibel (dB). The decibel scale is related to how humans hear sound. The decibel value increases as the sound gets louder. A decibel level of 0 means the sound is extremely quiet - like hearing a buzzing mosquito on the other side of your backyard. A decibel level of 200 is extremely loud - like standing beside a Saturn V rocket as it is firing. As you can imagine, the louder the sound, the less time you can spend safely listening to a sound. Sounds of 85 dB or greater can cause permanent hearing damage. Loudness of sound can be measured using a decibel meter, which may also be called a noise meter or a noise dosimeter. The noise in a room, such as a classroom, can affect how you feel physically as well as mentally. Hearing noise can lead to increased stress, which can increase your heart rate and cause your blood pressure to go up. Noise can also make it difficult to hear and understand your teacher and can even make you feel anxious, uptight and irritable. So does that mean classrooms should have no noise at all? Not necessarily. A very quiet room is good for when you are done the most difficult tasks, such as writing a test. When doing creative tasks, some noise can actually be a good thing. So, what is the optimal or ‘best’ maximum noise level in a classroom? The World Health Organization (WHO) recommends a maximum background noise level of 35 dB in schools and research has shown that students learn best when their teachers’ voices are 10 - 15 dB louder than the background noise. So, ideally a classroom should be around 45 - 50 dB. Although sound does not travel in the vacuum of space, the inside of the International Space Station (ISS) is quite noisy. The many pumps and fans that help make the ISS inhabitable by controlling the station’s heat, humidity, and carbon dioxide levels also make a lot of background noise inside the station. The exercise equipment on board the station, especially the treadmill, can also be very noisy. High levels of noise on the ISS can be a problem for astronauts. Noise can make it difficult for them to concentrate or hear each other or ground control, as well as hear warning sounds and alarms. High noise levels can also lead to vibrations in the station itself, which can affect experiments. Noise has always been an issue with long-duration spaceflight, and NASA and other space agencies have flight rules about acceptable noise levels that astronauts can be exposed to. NASA’s ISS Noise Level Constraints Flight Rule says that astronauts should not be exposed to more than an average of 70 decibels (dB) of noise over a 24-hour period. The acceptable level during the period’s 16 hour “work” time is 72 dB, while the acceptable level during the 8 hours of “sleep” time is 62 dB. It is important to note that the decibel system for measuring sound is what is called a logarithmic scale. This means that 60 dB of sound is actually 10 times louder than 50 dB, 70 dB is 10 times louder than 60 dB, and so on. You can get an idea of what the ISS sounds like by listening to this recording made by Canadian astronaut Chris Hadfield in 2013. Noise is measured on board the ISS through what are called acoustic dosimeters. These devices measure and record noise levels at different places on board the station. There are three of these devices that can be placed in different areas of the ISS to measure sound in those areas and help to find equipment that is especially noisy. This can help to identify items that are not working properly, such as a dirty fan or a computer hard drive that is out of alignment. Astronauts can also wear what is called a crew-worn acoustic dosimeter to measure the noise that they are exposed to over a 24-hour period. These devices then download the data to Earth, where it is analyzed by specialists who watch for possible hearing loss. Astronauts can wear “hearing protection devices” (earplugs!) if they are working in a high-noise area of the station. While the ISS in 2018 is not a quiet environment, it is an improvement over the station’s early days, when astronauts on board has to wear hearing protection all the time. 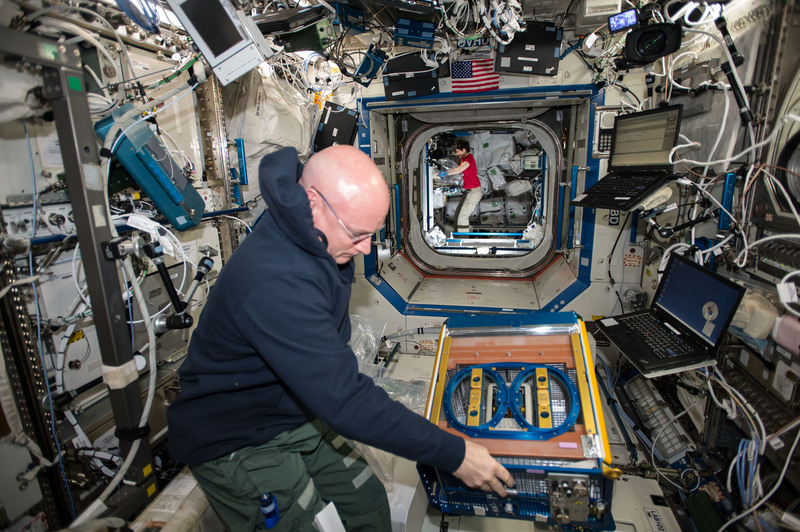 The ISS partner nations are always looking for ways to make the station quieter by switching out older fans and pumps, adding insulating covers, and making sure that equipment is always working properly. Some astronauts who stayed on the Soviet Salyut and Mir space stations in the 1980s and 1990s had permanent hearing loss because of the constant high noise levels on board those stations.